National wealth, the value of non-financial assets in the Canadian economy, rose 1.9% to $11,119.4 billion at the end of the second quarter, an acceleration from the 1.3% growth in the first quarter. The growth in the second quarter was led primarily by an increase in the value of natural resources, as crude oil and timber prices rose. Real estate also contributed to the growth in national wealth. On a per capita basis, national wealth reached $298,777. 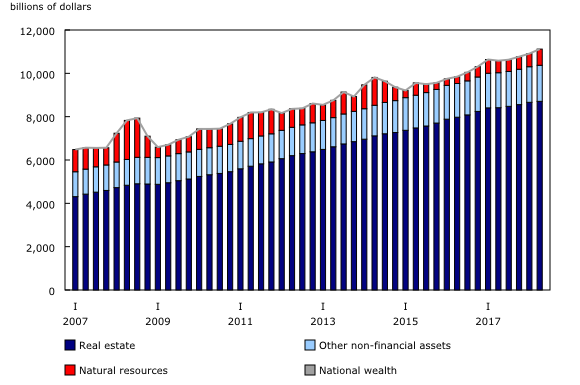 National net worth, the sum of national wealth and Canada's net foreign asset position, increased 1.7% to $11,638.1 billion at the end of the second quarter. Net worth grew at a slower pace than national wealth due to a decline in the net foreign asset position. 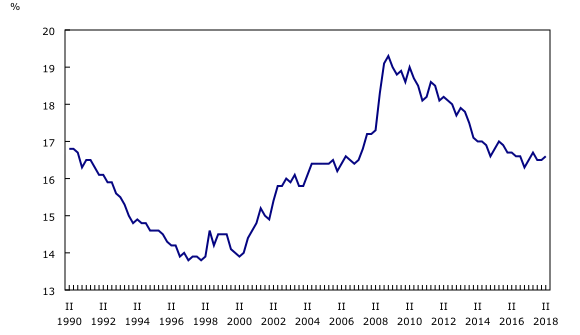 Canada's net foreign asset position decreased by $15.1 billion to $518.7 billion in the second quarter. This decline mainly reflected net borrowings of $10.4 billion from international financial transactions to finance the current account deficit. 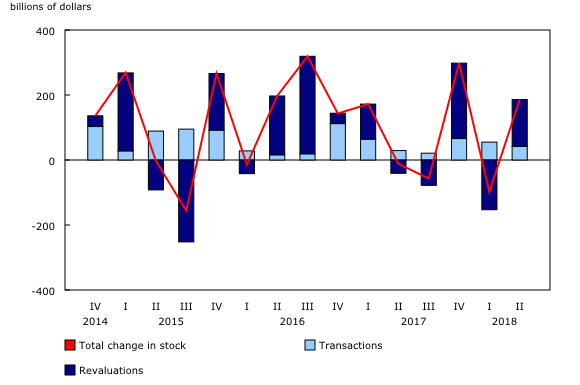 The stronger performance of the Canadian stock market relative to other major stock markets, pushing the value of international liabilities up by more than international assets, also contributed to the decline. Net worth of the household sector rose 1.1% in the second quarter to $11,058.0 billion. Overall, the debt to asset ratio remained relatively unchanged as growth in assets narrowly outpaced growth in liabilities. The value of non-financial assets rose $43.1 billion in the second quarter, mainly due to growth in the value of residential real estate, which reached $5,209.8 billion. Growth in the value of residential real estate has proceeded at a slower pace over the last five quarters due to more moderate housing resale prices. Financial assets increased 1.5% as domestic markets recovered from a weaker first quarter, when financial assets fell 0.2%. Equity and investment funds increased $48.3 billion in the second quarter, following a $48.7 billion decline in the first quarter, while life insurance and pension funds rose by $32.0 billion. On a seasonally adjusted basis, total credit market borrowing slowed for the second consecutive quarter as households borrowed $19.6 billion, down from $22.2 billion in the previous quarter. While consumer credit increased (+$1.7 billion), this was more than offset by a decline in both mortgage (-$3.6 billion) and non-mortgage (-$0.8 billion) loans. On an unadjusted basis, household credit market debt (consumer credit, and mortgage and non-mortgage loans) totalled $2,166.0 billion in the second quarter. Mortgage debt reached $1,415.5 billion, while consumer credit stood at $642.4 billion. 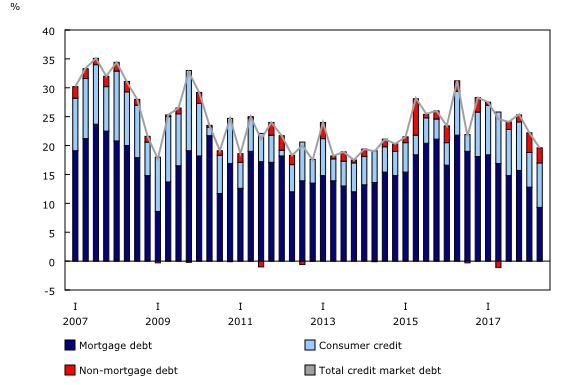 Credit market debt as a proportion of household disposable income (adjusted to exclude pension entitlements) increased to 169.1%, as credit market debt outpaced income. In other words, there was $1.69 in credit market debt for every dollar of household disposable income. On a year-over-year basis, the household credit market debt to disposable income ratio declined 0.4%. Similarly, the growth in the value of total credit market debt has been steadily declining. The federal government demand for credit market debt was $2.6 billion in the second quarter. This was led by $8.8 billion of net issuances of short-term paper, which more than offset net retirements of bonds. 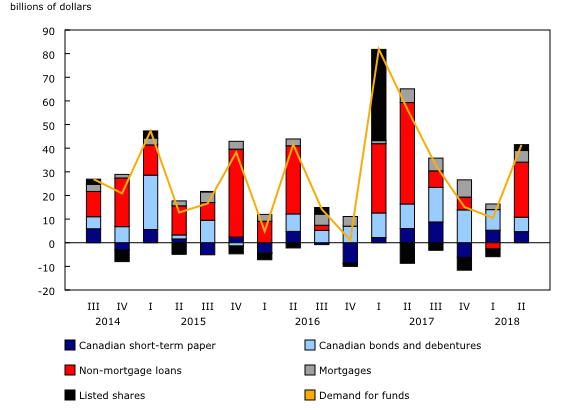 The demand for credit market debt by other levels of government was $17.5 billion, the majority of which was net issuances of provincial bonds and debentures (+$15.2 billion). The demand for funds by non-financial private corporations was $41.4 billion in the second quarter, the highest value since the second quarter of 2017, when significant mergers and acquisition activity occurred. The bulk of this financing in the second quarter of 2018 was provided by the banking sector in the form of non-mortgage loans. Non-financial private corporations' debt-to-equity ratio (book value) edged down in the second quarter to 72.6. However, on a year-over-year basis this ratio was 4.6 percentage points higher than the same quarter last year, continuing an overall upward trend. The financial sector provided $66.5 billion of funds to the economy through financial market instruments in the second quarter, up from $49.7 billion in the first quarter. This was mostly attributable to non-mortgage (+$20.7 billion) and mortgage (+$18.4 billion) loans. While mortgage lending increased in the quarter, this reflected the normal seasonal pattern of lending activity; however, on a year-over-year basis, mortgage lending was down considerably. The value of financial assets of financial corporations increased by $289.8 billion to $14,118.9 billion at the end of the second quarter. Revaluations and other volume changes of $151.4 billion, led by equity investment of institutional investors and mutual funds, on the strength of foreign and domestic markets, and transaction activity of $138.4 billion contributed together to the higher value of financial assets. This second quarter release of the national balance sheet and financial flow accounts includes revised estimates from the first quarter of 2018. These data incorporate new and revised source data, as well as updated seasonal trends. Later this year, at the time of the third quarter release, data enhancements to the national balance sheet and financial flow accounts, such as the development of detailed counterparty information by sector, will be incorporated. At this time, estimates will be revised back to 1990 to ensure a continuous time series. With this release, the debt service ratio is now published in the quarterly release of the Financial and Wealth Accounts in table 11-10-0065-01, Debt service indicators of households, national balance sheet accounts. Data on the national balance sheet and financial flow accounts for the third quarter will be released on December 14, 2018.